Primakov took to the post of foreign minister so naturally and tactfully that it seemed to his colleagues that he had already held the post for a long time, even though winning the respect of career diplomats is never easy, especially if you are not one of them. “He took to the post of foreign minister so naturally and tactfully that it seemed to his colleagues that he had already held the post for a long time, even though winning the respect of career diplomats is never easy,” former foreign minister of Russia Igor Ivanov said about working with the late Yevgeny Primakov. I believe everything in life happens for a reason. Upon graduating in 1969, I received a job at the highly respected Institute of World Economy and International Relations of the Soviet Academy of Sciences. I was an aide to its director, Nikolai Inozemtsev, a member of the Russian Academy of Sciences. In December 1970, Yevgeny Primakov was appointed deputy director of the institute. He had just returned from a long posting in the Middle East, where he was a special correspondent for the Pravda daily. His appointment shocked many who wondered why such a high post was given to someone from outside of academia. But the doubts were soon laid to rest by Primakov himself, who proved that he was not only an outstanding scholar but also a brilliant administrator. This speaks volumes about Yevgeny Primakov. He would go on to create Russia’s Foreign Intelligence Service from scratch, serve as foreign minister at a very difficult period in our history and later prime minister after the destructive 1998 crisis. He quickly won the respect and trust of the institutions to which he was appointed, owing above all to his unique personal qualities. Primakov was a leader. He won respect not because he was appointed to a leadership position or through behind-the-scene machinations, but thanks to his erudition and refinement, his hard work, and his respect for colleagues whose opinions he was always willing to consider. Of course, I did not learn all this at the Institute of World Economy and International Relations, where we met, but much later. In January 1996, I was driving home from a diplomatic function when I heard on the radio that Yevgeny Primakov had been promoted from the Foreign Intelligence Service to the post of foreign minister. I was first deputy foreign minister at the time, and so the news affected me personally. By that time, I have worked with five foreign ministers – Anatoly Gromyko, Eduard Shevardnadze, Alexander Bessmertnykh, Boris Pankin and Andrei Kozyrev. I knew very well that such reshuffling is followed by a difficult transition and sometimes even dismissals. But Primakov took to the post of foreign minister so naturally and tactfully that it seemed to his colleagues that he had already held the post for a long time, even though winning the respect of career diplomats is never easy, especially if you are not one of them. I know this from my own experience. I could tell you so many interesting things about Primakov’s work at the ministry, but I will limit myself to the most important aspect. Primakov’s appointment as foreign minister marked the start of a new direction in Russia’s foreign policy that fully met our long-term national interests and reflected the fundamental trends in international relations. Working with Primakov was very interesting. He knew how to inspire people, how to captivate them with unusual ideas. He also had a knack for listening to others. He used logic and the power of his convictions to persuade. He never boasted about past achievements or posts. This is why he quickly became one of us, and remains one of us – a man whom future generations of diplomats will remember as leading the ministry through one of its best periods. I wrote that I was lucky to have very good bosses, whom I saw as models and from whom I tried to learn as much as possible. Yevgeny Primakov was one of them. I was lucky to work as his first deputy. Our work was our life. We were like-minded individuals. I would even say that our collaboration gradually turned into friendship. This did not interfere with our work, though. Rather, it encouraged us to act even more responsibly. Just like the news of Primakov’s appointment as foreign minister, his appointment as prime minister in September 1998 came as a complete surprise to me. I was returning to the ministry from the State Duma when I received a call summoning me to Primakov’s office. He showed me the executive order on his recent appointment. I could see that he was worried. It was a difficult decision. He also showed me another executive order appointing me foreign minister. “I had no time to consult you,” he said. “I trust you, and the president has supported my proposal. 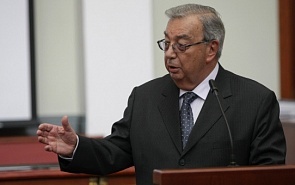 So take over.” This is the kind of man Yevgeny Primakov was: a statesman, a professional, and a friend. No one will ask “Who is Yevgeny Primakov?” He became a legend in his lifetime and added several important pages to his country’s history.